16 ounces of taffy in a collectable wooden crate. 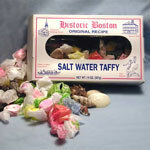 Cover shows a sailor with the words Boston and Salt Water Taffy. Assorted flavors. Approximately 60-70 individually-wrapped pieces.